In the past month, I have read more than 100 cover letters from folks applying for the play-by-play openings at Montana State University and Clemson. Here are a handful of common mistakes that people are making. Other than changing the name of the school, some people sent the exact same letter for MSU as they sent for Clemson. State in your opening paragraph what is it about that school that is attractive to you. Be sure to make it about them, not about you. 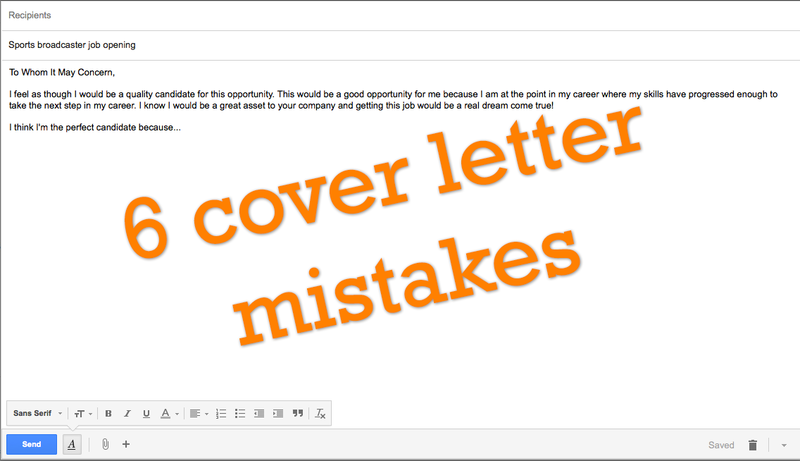 Writing, “This would be a good opportunity for me because….” is hurting your letter, not helping. 3. I feel as though I would be a quality candidate for this opportunity. Of course you do. Otherwise you wouldn’t be applying. Omit this throwaway line. 4. Getting this job would be a dream come true. Focus on your experience that is relevant to the position. If you are applying for a basketball job, it is counterproductive to spend multiple paragraphs detailing your experience in other sports. Eight years of broadcasting water polo doesn’t make someone a better candidate for a football gig. Give the employer your elevator pitch. Two-thirds of a page, max. The longer your letter, the less time most employers are going to give to it.